The cutting edge of hydration systems. 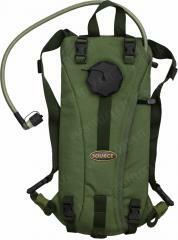 Source is a well known and respected manufacturer by civilians and military personnel alike. If something for the military is designed in Israel, it is virtually always robust, reliable and practical. Source is no exception. 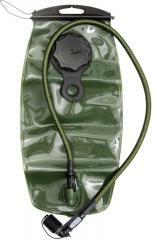 This simplified 3 litre hydration carrier can be used as a backpack. 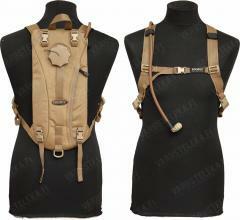 The shoulder straps feature quick-release buckles and a chest strap. It also features four D-rings on the sides if the carrier needs to be secured to something. 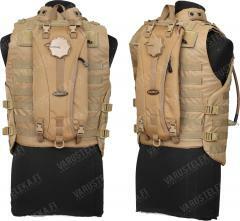 The carrier is made of heavy cordura and all the buckles and fasteners are excellent quality hard-wearing plastic. The best thing about Source's hydration systems is probably the bladder and its lining, which makes the life of harmful bacteria, algae and fungi difficult, effectively keeping the bladder cleaner for longer. Of course, it is still recommended to clean it periodically, but it needs far less care than most hydration bladders. This makes it ideal for combat situations where cleaning is not always possible. The tube is protected by a thick cover, and the mouthpiece is in a 90 degree angle, so the tube itself can be kept shorter. Source is one of the leading makers of hydration systems on the worldwide market, their gear are used by militaries and law enforcement units all around the globe. High quality and absolutely reliable, this stuff is made for real use! Aivan loistava vehje. Erittäin kestävä ja helppokäyttöinen, jota tulee käytettyä kesät/talvet. Juomareppu letkuineen vain takin alle niin ei jäädy talvella. Ainut miinus tulee mukana tulleen suuttimen heikohkosta laadusta, suutin alkoi halkeamaan muutaman kuukauden jälkeen ja lopulta kumiosuus tippui pois. Suosittelen Helix Valvea tämän tilalle.